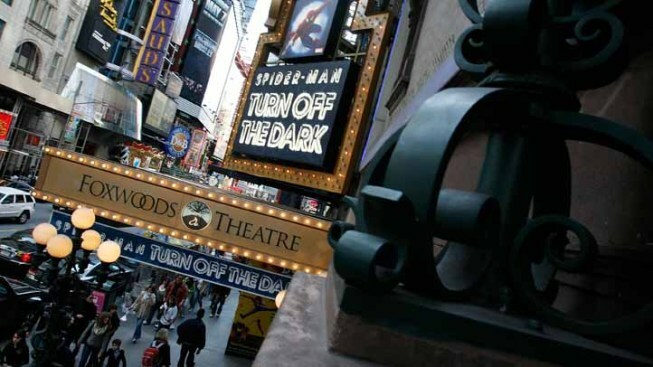 With the official opening of "Spider-Man: Turn Off the Dark" just hours away, the creative team behind the musical and cast members are rallying behind a person often considered the comic book show's real villain — ousted director Julie Taymor. "I think it's unfair what's been done to Julie, and how she's been made to look," says Reeve Carney, who plays Peter Parker and the web-slinging hero in the $70 million musical that opens Tuesday night at Foxwoods Theatre. Taymor was dumped from her own show after delays, accidents, poor audience reaction and money woes turned the musical into a punch-line. Producers intervened in March, firing the Tony Award-winning co-writer and director, and shut down the show for four weeks to retool. Taymor was replaced by Philip William McKinley, who directed the Hugh Jackman musical "The Boy From Oz," in 2003. But McKinley, in an interview, equated his role more to that of a relief pitcher. "I wanted to honor her work," McKinley said. "I wasn't at all here to scrap everything and start over." 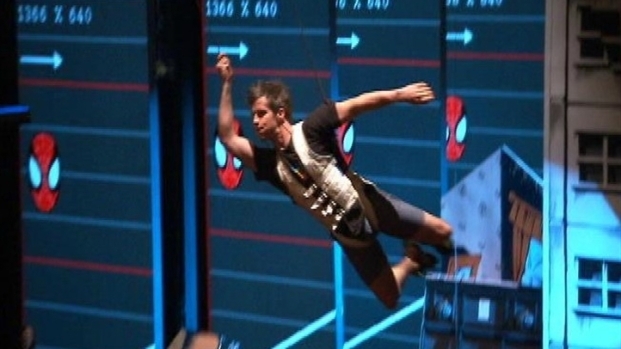 A rare look at the flying rehearsal for one of the actors playing Spider-Man. The role is so demanding it takes nine people to play it. Many elements of Taymor's original vision remain, but the sequence of events and some of the characters she wrote expressly for the show have been changed. The songwriters, U2's Bono and The Edge, also reworked the music. The so-called Geek Chorus — four comic-book fans who framed the plot and represented Taymor, Bono, The Edge and co-book writer Glen Berger — have been cut from the show. The role of a villainous spider-woman named Arachne has been scaled back into a fairy godmother. Meanwhile, the Green Goblin's role has been enhanced. Even so, many of Taymor's visual touches are still in the musical. Aside from problems with the story, the show was beset with technical malfunctions, ranging from stunt actors left dangling helplessly over the audience to the near-fatal fall by stunt actor Christopher Tierney in December. Tierney, who does most of Spider-Man's aerial stunts, suffered a fractured skull, a fractured shoulder blade, four broken ribs and three broken vertebrae when he tumbled in front of a shocked audience after a safety harness failed. He has since returned to the show. Berger, who has been with the project for six years, says Taymor was unjustly blamed for everything wrong with the show, including Tierney's fall. "Julie was unfairly named for any number of things including the safety aspect," he says. Members of the creative team cite injuries at other shows. Carney points to a similar accident that happened at "The Little Mermaid" in 2008 when actor Adrian Bailey fell nearly 20 feet through a trap door that was supposed to be closed. "He is still recovering from that (fall) two years later, and Chris recovered in three months, thank goodness," Carney said, adding that the "Littler Mermaid" accident isn't talked about as much. Taymor did not discuss the show's opening with The Associated Press. "It doesn't seem like something Julie would have anything to add to, but we appreciate the opportunity," her representative, Chris Kanarick, said Monday. But Taymor spoke at the Technology Entertainment and Design conference in California in March and discussed how she's dealing with the Spider-fiasco, saying, "Anyone who creates knows — when it's not quite there. Where it hasn't quite become the phoenix or the burnt char. And I am right there." The bad press for "Spider-Man" started as soon as previews began on Nov. 28, when an actress was injured by a length of rope. Its planned opening was initially set for Dec. 21, but that was pushed back to Jan. 11, then again to Feb. 7 and then March 15. It has easily broken the record for having the longest preview period in Broadway history. All the bad press — including critics who slammed the show in February — didn't hurt at the box office, where the musical regularly sold out and was among the highest earners on Broadway. But ticket sales had softened considerably the by time the show shut down in April. Consistently strong weekly revenues are critical for the show to break even and to begin repaying investors. Getting fired from her own musical caps a bad stretch for Taymor, lauded for her vision in the long-running "The Lion King." The Tony Award-director's film "Across the Universe" did poorly a few years ago and her current movie, "The Tempest," is not setting box-offices afire. But many members of the "Spider-Man" team have lately come to Taymor's defense, including Bono, who called Taymor a "card-carrying genius," and T.V. Carpio, who plays Arachne and says, "The foundation of what makes the show amazing and magical is what came out of Julie's head." Berger acknowledges that audiences were confused by their original tale, which fused the traditional Spider-Man origin story with a mythical Spider-Woman. The climactic battle between Spider-Man and the Green Goblin happened long before the finale and the love story between the lead characters was perfunctory. He says the original story made sense on paper, but admits "undeniably" that his writing did not translate as smoothly on stage. He blames complex stage directions and multiple plotlines as the culprit. He and newly hired playwright Roberto Aguirre-Sacasa, who has written comic books and for the HBO series "Big Love," toned down the story's darker themes, and expanded the romantic angle between Peter Parker and Mary Jane. While there may be affection and admiration for Taymor from many in the cast, there are also unresolved financial matters. The Stage Directors and Choreographers Society filed an arbitration claim last week against the show's producers, saying they had "failed to pay to Ms. Taymor any royalties for the run of the production." Lead producer Michael Cohl acknowledged that there were some lose ends: "There are some deals that have expired and that we've parted company. There are others that we still haven't quite finished up the business yet and there are things to be resolved." Added fellow producer Jeremiah J. Harris: "All in all, and there's a lot of moving pieces in this project, we've had a successful collaboration." For 20-year-old Jennifer Damiano, who plays the heroine, the spectacle accelerated her experience level. And while she acknowledges she didn't realize what she was signing up for when she took the part, she is grateful Taymor gave her the opportunity. "I wouldn't take back a second of the experience, even the negative," Damiano said. Once downtrodden, the cast and crew say they have been reinvigorated by the overhaul of the musical. They've even taken the show's main song, "Rise Above" — with the lyrics "You can rise above/Open your eyes to love" — as an anthem of their journey.